Floristry is all about design colour and harmony, so when you are creating an arrangement you must always have these things in mind. Having a theme can also make life a lot easier!Certain times of year lend themselves to certain types of colour and winter is no exception. When we think of winter we think of white snow, ice and freezing conditions. Certainly in the typical winter picture postcard towns in Austria and Switzerland, everything looks so sparkling and bright. There is absolutely no reason why you can’t recreate that fresh icy feeling in your floral designs. White can be a difficult colour to work with as it is so stark. It’s a very marked contrast with darker colours and can look too contrived. However if you stick to just white with metallic or clear crystals the effect can be absolutely stunning. Add a few feathers or some ribbons to give movement and texture then you have a design that has the real “wow” factor. The main thing to always remember is not to “overcook” it. White is a very simple colour and it doesn’t need a lot to look amazing. But if you do find white too much as a single colour then there are plenty of off-white coloured flowers that can just take the edge off and still give you the same effect. This design is perfect for a winter wedding and it certainly incorporates that “wonder” factor. You can hang these beautiful cornets of flowers from thin wire, from the ceiling and even decorate them with twinkly fairy lights – very romantic; or use them as chair backs or pew ends at a ceremony venue. Change the colour and they can be used at any time of year. 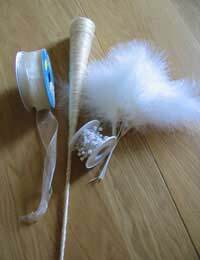 One cornet ( these do come in different sizes available from florists’ wholesaler) floral foam; florabond; white feathers; five white roses (open carnations are equally as suitable); sheer ribbon; decorative wire; glue gun. Cover the cornet with the sheer ribbon by gluing the end of the ribbon at the base of the cornet and slowly and evenly winding it up towards the top. Cut the end and secure by tucking it inside the cornet and gluing it in. Place a small strip of florabond inside the edge of the cornet and cut, round off and slightly dampen a piece of floral foam to fit. This should rise at least three inches above the cornet. Push the foam into the top of the cornet securely. If you are going to hang this design over a chair of pew end you can create a ribbon “hook” which can be glued or stapled into the cornet for hanging. If you want to hang it from thin wire then you really need to secure a proper hook into the cornet.